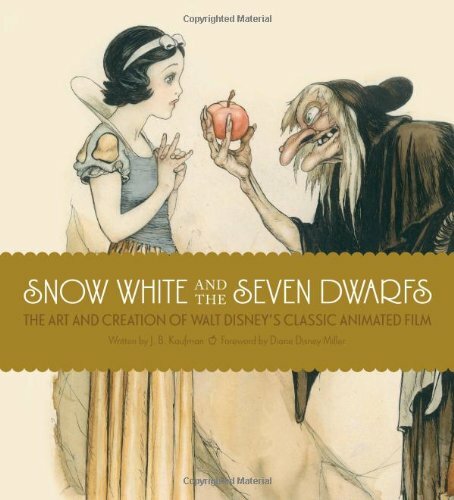 Celebrating the 75th anniversary of the release of Snow White and the Seven Dwarfs, this book tells the fascinating story of the making of Walt Disney's groundbreaking animated classic. More than 250 artworks, including rarely seen concept sketches, background paintings, and cels illustrate the genius of Walt Disney and the creative vision of the artists who produced a beloved milestone in cinematic history. In 1933, Walt Disney was a rising star in the world of animation, just beginning to become a household name. Ambitious new ideas emerged from the Disney studio on a regular basis, and the film world waited eagerly to see what the creative young filmmaker would do next. The answer surprised them all: a full-length animated feature film, based on the traditional tale Snow White and the Seven Dwarfs. The production took three years and the talents of many of Hollywood’s top artists . . . and, of course, created one of the best-loved classics of all time. This book, based on a ground-breaking exhibition of both familiar and never-before-seen art from the Walt Disney Animation Research Library, walks the reader scene by scene through the movie, accompanying the art with behind-the-scenes stories about the film’s production.